This is a repost from my other blog, at laurelindon.com. Now 100% more movie star! 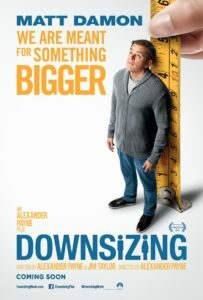 In 2017, I made my debut on the silver screen with my role in the science fiction movie Downsizing, made by Oscar-winning director Alexander Payne and starring Matt Damon. Never in a million lives would I have thought that I would once be in a major motion picture! It was the experience of a lifetime. I had the exquisite joy and honour to play the engineer/scientist Torvald, who introduces Matt Damon, Christoff Waltz and Hong Chau (together with the inestimable Swedish actress Margareta Petterson) to a doomsday vault in Norway. The attached picture is from that scene, occurring towards the end of the movie. Check out my IMDB page (though there’s not really anything there…). The premise behind Downsizing is that at some point — not long from now — Norwegian scientists invent a method for shrinking people and objects down to only a fraction of their size. A downsized person is only 10 – 15 cm tall. They bill it as the ultimate solution to the problem of humanity’s ecological footprint: the consumption of a downsized person is commensurate to their size. But of course it doesn’t quite work out that way. Downsizing really becomes an escape hatch for low and middle income earners wanting to multiply their wealth, and oppressive governments wanting to shrink their prison populations. And for down-on-his-luck Matt Damon, a.k.a. Paul, life as a downsized person does not go as planned. Along the way, as a good science fiction movie should, the film tackles heavy social themes that are also problems in the present, including a wall, immigration, inequality, the meaning of life, and environmental destruction. If you haven’t seen it yet, I strongly recommend it. So how on earth does a humble Norwegian academic with zero (zilch, nada, none) acting experience end up in a Hollywood production? Well, it went like this. I saw a casting call for background actors of Scandinavian heritage. I thought it would be fun if my son Sebastian and I could be extras in a movie. So I took him to what I thought was the right casting call. Turns out it was not — it was the general casting call. Which I didn’t clue into (hey, I’d never done this before). So we did an interview with a casting assistant in front of a camera and went home. Then about a week after, I get a call with an offer to do an audition for an actual role in the movie! And they sent me part of the script, with seven lines to practice (some quite long). During the audition, the casting director had me read those lines again and again and again until he deemed I had survived. The message was, don’t try to act – just be your academic self. Then I went home again, and only a few days later I got another phone call: could I do another audition – with Alexander Payne? I did, and was offered the role, on the spot. Shooting commenced in June 2016. I got two days on set, taking part in two scenes, which was absolutely fascinating. The main scene, were the speaking part took place, was set in a subway maintenance tunnel in Toronto (Line 1 near Yonge St and 401). The scene took seven hours to shoot. One reason it took so long was that every three minutes there we could hear subway trains going past at the other end of the tunnel and feel a ferocious rush of air, though we couldn’t see them, since the end of the tunnel was blocked off by a green screen. Every angle had to be shot again and again, 10-15 times. Not all in one go, but about a third or less at a time. I delivered my lines in every take, on and off camera. At one point, the camera was shooting from my vantage point, so I had to sit practically on the camera dolly, with the camera and cameraman hovering over me to my left, and Alexander to my right. Most of the time I had to have eye contact with Matt Damon, he’s the one mainly being introduced to the vault and its contents. Every time they changed the camera position, we got a 10-15 minute break, so we would meet our stand-ins coming in as we went out. The stand-ins were there to help set up the scene and where everyone would be. Then we would come in again and take over (I wonder how you get into being a professional stand-in). We never had any longer breaks, filming went on continuously the whole day. For almost an hour I was the centre of attention as I delivered my lines. Alexander Payne, the director, was mostly hands-off during my performance, just whispering small adjustments in my ear or suggesting different ways of doing things. Don’t turn so fast. Point to the monitors while you’re saying that. Try looking from Margareta over to Matt while you’re saying that. Now try the other way. And finally, excellent work. views of streets, homes, farms and pastures. The other scene I participated in took place at the Milton Historical Society, a village of mostly 19th century houses just outside Toronto. The scene was a party in a Norwegian community hall. Shooting took place at night, not wrapping up until around 3 in the morning. In that scene I was just an extra, but you can clearly see me in the movie, sitting behind Matt. Matt Damon, by the way, was very nice, laid-back, funny and approachable. Margareta Petterson became my friend. So that was my career as a movie star. There’s an addendum to the story, however. At some point in the movie, during a presentation on the downsizing procedure, a still photo of a person in the Vitruvian man posture (you know, by Leonardo da Vinci) is shown — stark naked. I was offered to do that. I declined.